Logitech Harmony is the first brand that comes to mind when most people think of Universal remotes. The company’s products pack tons of features, and some even work with Alexa. But it turns out that most people aren’t looking for all those features. 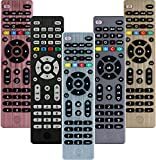 Instead, they want simplicity and affordability, and that’s exactly why the GE 33709 4 Device Universal Remote is the best-selling universal remote on Amazon’s entire website. It has just about all the basic functions you might want and it costs just $9 and change. The biggest thing it lacks is probably backlighting, but there’s an upgraded version on Amazon that’s just a few bucks more. Best remote Code library – This universal remote works with all major brands and Supports thousands of the latest audio/video equipment. Does not work with Roku streaming stick or Amazon fire TV/stick.